If you’ve read about the Whole30, then you know what KATT stands for; if not, it means Kill All The Things. With the changes that you go through from having sugar to none – having carbs to none, your body is transitioning and you can be quite emotional and moody. Who would’ve thought that food has so much power? Well, today was quite the roller coaster for me. I definitely felt some KATT throughout my day. Who’s gone to work and had someone ask you to do something, but within the time that they typed the email and sent it, they could’ve done exactly what they are asking you to do? Well, that happened today for me and it almost sent me over the edge. I did feel like overall, today was a good day of Whole30 even with having these KATT moments. MG– I drank half a gallon of water! Even with all the emotional stress that I had today and the moments of wanting to kill a co-worker, I didn’t cave and eat any of a Moon Pie and peanut butter pie that someone had made. MG– My timing of eating. I ate lunch super late (I was hungry earlier and just ignored it), so then I wasn’t really hungry come dinner time. G– I could’ve used my time more efficiently so I didn’t have to eat dinner in a hurry. MG– Continue to drink water and try to eat more on a schedule. G– Restock emergency food and keep eating breakfast before I go to work. Today we made a soup! 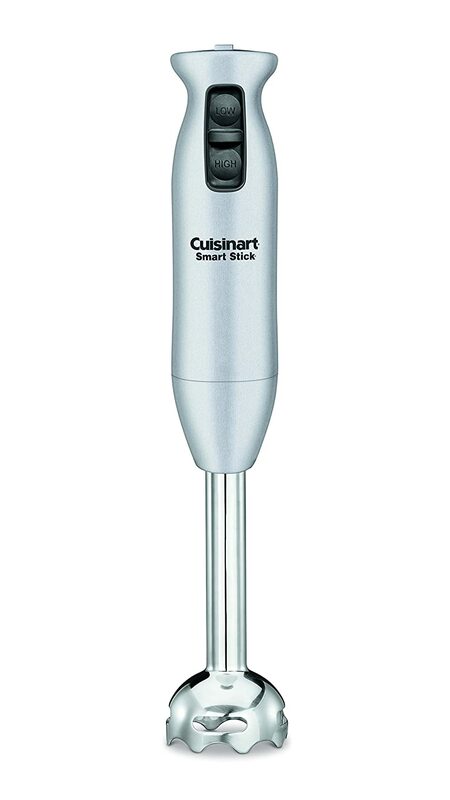 For Christmas we were given an Cuisinart immersion blender and it was the perfect opportunity to break it out of the box. We will definitely be utilizing this kitchen tool way more often. I’ve heard they are fantastic for Bulletproof Coffee. Anyone have a good recipe for that?? Previous Post Day 6 – Totes Awesome!